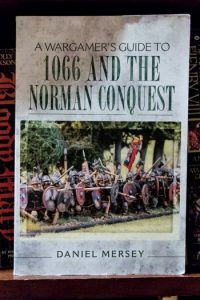 A Wargamers Guide To 1066 And The Norman Conquest is one of a new series of books from Pen and Sword publishers that bring a wargamer’s perspective to critical periods in military history. The third chapter looks at the individual battles of Fulford, Stamford Bridge and Hastings. For these, Mersey offers brief descriptions from primary and secondary sources, and then extracts key points that a gamer should consider when developing a scenario. Chapter Four looks at broad themes of the period and how they can be applied to existing rules sets. The fifth chapter takes a look at some existing rules sets — both commercial and free — and discusses their merits. Chapter Six is a discussion of available figures. Finally, the last chapter offers five more general period scenarios for gamers to try after exhausting the fun of the historical battles. Throughout the book, Mersey offers some nice recommendations for further reading, and follows it up with an appendix with additional titles. My one wish for the book is that the battle descriptions and scenarios included some maps. While maps of Hastings, et. al. are readily available, it would have been nice to see them in the book with references to things mentioned in the text. 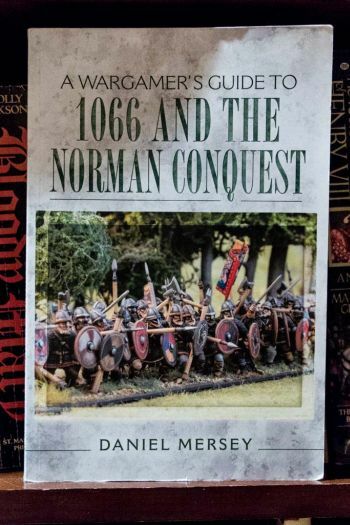 For the newcomer to the period, A Wargamers Guide To 1066 And The Norman Conquest is a nice starting point. It is not a comprehensive history, nor a rule set, but it does offer a road map for beginning to wargame the period. Veteran gamers also may find something here. I have long been interested in the Norman Conquest, and have large collection of Normans, Vikings and Saxons. I consider myself fairly well-read on the topic, but still found a lot of points to ponder. For example, Mersey offers the question of what might have happened if William had landed much earlier. In that case, Harold might have faced the Normans with a much stronger army; the victor of that battle then would have needed to turn north to take on Harald. That simple twist offers two (or more) completely different historically plausible scenarios to play. I like the book and look forward to seeing others.